What is CrossFit? CrossFit is World-Class Fitness for EVERYONE. For the first two years CrossFit O-Zone’s purpose was to make CF a little less intimidating to the uninitiated. Below are the archives of the pages from that original CFOZ site. Many people go to the CrossFit HQ site and, due to the overwhelming amount of material, don’t know where to start. Some, due to medical reasons, recent illness, pregnancy or many years of de-conditioning and weight-gain find that they have a hard time even doing the “puppies” version of the WODs at Brand X Martial Arts. I know what it’s like to start from scratch. Here, I try to break it down into the basics, to remove the extra and help you start taking baby steps. I highly encourage everyone to find your local CrossFit affiliate, once you feel comfortable doing so, for hands-on instruction from some of the best trainers in the world. If you don’t have one near you, then you can graduate to Brand X scaling. Everyone has to start somewhere. The important thing is that you start! Here (Win and Mac) is a great example of scaling to all fitness levels, if Mary can do this, so can you. Here is an article from by the creator of CrossFit, Greg Glassman from the CrossFit Journal. Make sure you are in good physical health and please consult you physician before beginning any exercise routine, including this one. Most of all use your common sense! Most people find that the best place to begin is with two rounds of the CrossFit Warm-up (CFWU). Those of you who are coming from a none-exercise background will probably find this to be all you can do for the first week or two. After a couple weeks of just the warm-up on the prescribed schedule, most will be ready to begin the scaled back Workout of the Day (WOD). Start with the current post; you do not have to go back to the begining. If you are unsure of something, e-mail me or put your question in the comments. The answer may help others with similar questions. You will find a detailed explanation of the CFWU on the Exercise Page. You will also find video demos from CrossFit to help you learn proper form and hopefully to inspire. My hopes are that this will be the beginning of your journey to Fitness and Health. Some of you will eventually want to start pushing the envelope a little and journey to your local CrossFit Affiliate to get some hands-on instruction. I highly encourage anyone who has an affiliate nearby, to go. You will not find a more supportive and encouraging community anywhere! If you do not have an affiliate near you, you can step up to the next level of training in your home gym or local globo gym by following the Brand X Martial Arts’ scaling. It’s not very far off the mark. Every day you will start with CFWU x 2 (eventually 3). This means do some kind of light cardio for two minutes. It can be running, rowing, jumping rope, jumping jacks, anything that will elevate your heart rate and get your muscles warm. Then you will do a 30 second samson stretch (each side). In a lunge, stretch both arms overhead with fingers interlaced and facing the ceiling. Obviously x 2 means to do this twice. For many of you, especially, those who just gave birth, this may be all you do, and that is fine. Most of you will find yourselves sore after the workout, especially over the next two days. This is also normal. Get the blood flowing into the muscles and it will go a long way towards relieving muscle soreness. Remember this is a warm-up. No need to time this or to do it for intensity, that will come in the workout, just concentrate on your form. Edit: You do the two minutes of cardio and the samson stretches only one time at the beginning of the warm-up, then you do the two or three rounds of the rest of the exercise. Disclaimer: Many CF videos contain language and/or music which is not work/family safe. These videos are produced and made available completely free. If you are viewing these demos somewhere were that can cause problems, mute it. Demos courtesy of CrossFit.com. Feel free to do a search of any of the following months to see if one of the posted .com WODs is on the list. Here is a link to the CrossFit Journal article on building your own garage gym for the price of a one year membership at a globogym (i.e. Gold’s, Bally’s, L.A. Fitness, etc)…spandex is optional. 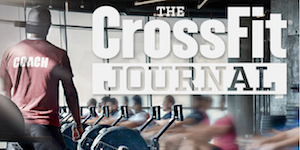 Edit: This article is now only available with a subscription to the CrossFit Journal, but believe me, since you get access to EVERY article ever written, it is worth it! Medicine/Slam Ball – Make your own. Get a basketball, drill a hole in it and fill it with sand. Use a scale to get the ball to 15 or 20 lbs. Before you seal the ball back up, get some air back in it, that will let it bounce stightly. These are great for thrusters, wallball, overhead squats, medball cleans, slam ball etc. Also, check out CrossFit Centurion‘s page about outfitting a crossfit-friendly gym on the cheap.